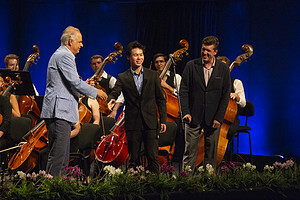 Timothy Chooi awarded Verbier Festival Academy’s highest honour | Dispeker Artists, Inc. This year’s Verbier Festival Academy’s Yves Paternot Award has gone to violinist Timothy Chooi. Named after the founder of the Friends of the Verbier Festival, the award is bestowed on the most accomplished Verbier Academy musician. The beneficiary receives a cash prize of CHF 10,000 (c. $10,000), an invitation to perform in a future Verbier Festival, and can claim up to CHF 15,000 for the completion of a project or educational opportunity. He will also be offered a residency with one of the Academy’s artist development partners, the Banff Center (Canada) or Snape Maltings (UK). Timothy Chooi, 24, is currently completing a Master’s degree at the Juilliard School in Catherine Cho’s class. A former student of the Curtis Institute of Music, he has previously studied with Pinchas Zukerman, Ida Kavafian and Patinka Kopec. He has previously won the Grand Prize at the 2010 Montreal Standard Life Competition, the EMCY prize for exceptional performance at the 2014 Yehudi Menuhin Violin Competition, and third prize at the 2015 Michael Hill International Violin Competition in New Zealand. ‘Timothy is an outstandingly talented young musician and communicator,’ said Stephen McHolm, Director of the Academy. ‘I am very honoured to receive this award, and I look forward to being part of the Verbier Festival family,’ Chooi said at the announcement of his award at the festival’s central concert hall, the Salle des Combins. Other string players given awards included cellists Christine J. Lee (South Korea) and Kristina Winiarski (Sweden), each winning a CHF 5,000 Jean-Nicolas Firmenich Prize; and the CHF 2,000 APCAV Award for French/Dutch violinist Cosima Soulez Larivière.